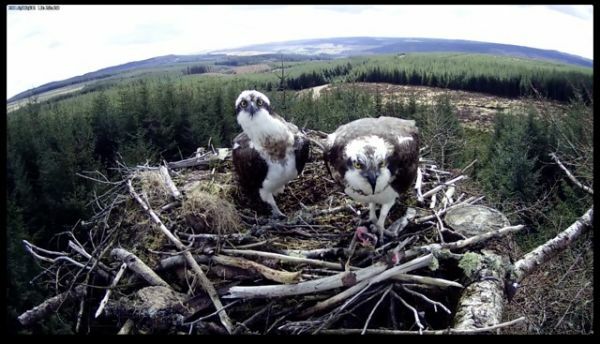 Bird lovers in Northumberland are celebrating an early start to their season with the earliest ever sighting of a bird on the Kielder Osprey nest and now the safe return of two pairs of birds. Yellow 37 – one of the ringed Kielder males - was first seen at Nest 2 on the 24 March, coinciding with one of the Osprey volunteer training days, an unexpected bonus sighting for the team of Northumberland Wildlife Trust volunteers who were busy preparing for the season ahead. Not only is it the earliest return of any Kielder Osprey to the nest, Yellow 37 was the second male home across all UK osprey projects. Since the first sighting, Nest 1 has seen the return of “YA”, on the 26 March, another record early return date for this male, with his partner arriving shortly after. Meanwhile, on Nest 2, Yellow 37 didn’t have to wait too long for his mate to arrive, with “Mrs 37” arriving safely back on the 30 March. This rare species were extinct in England for 150 years but have bred successfully in Kielder Water and Forest Park every season since they returned to north east England in 2009. The birds can be watched by visitors through nestcams on Nest 1 and 2, with footage beamed to a screen at the Kielder Castle café. Kielder Osprey Watch will be open every weekend at Leaplish Visitor Centre, from when the eggs hatch to when the chicks fledge, manned by the team of Northumberland Wildlife Trust volunteers. Wildlife lovers can keep up to date with the story as it unfolds through the Kielder Osprey blog at kielderospreys.wordpress.com. The Kielder Ospreys will feature on Further Tales from Northumberland, broadcast on Monday 4 April, on ITV.